I don’t know what conferences I could present at. I’m not qualified/good enough/experienced enough to speak at my industry’s conferences. The first excuse is one of ignorance, which is a terrible reason to never speak at conferences. It is remarkably easy to find conferences with a bit of internet searching. The second excuse is one of authority. It’s easy to consider all the hottentots that show up at your profession’s or industry’s conferences and then assume that they would have nothing to learn from you. 1) You have some kind of knowledge or ability that others in your field do not, regardless of your position. No one is an expert in everything. No one has “done it all.” The people who rise to the upper ranks of their field understand this, and they attend conference sessions to fill gaps in their own knowledge or ideas base. Don’t assume you don’t have an idea, or an application, or a story that would interest the CEO from the company across the street. Really good managers understand that people ranked under them have knowledge they don’t, and those managers seek to learn from those people. Really good employees understand that their experience and knowledge has value, and seek to share it with those above and below them in the industry hierarchy. 2) You don’t have to present at conference specifically related to your field of work. Maybe you have valuable knowledge that can be applied to other industries. Maybe your work as a front-line process engineer would be hugely interesting to the people attending a conference targeted at managers in the oil industry. Maybe your work as an early childhood educator can be applied at conference for public librarians. Maybe your knowledge of viral internet marketing would be of interest to the registered dieticians at a health conference. Hell, maybe there’s a conference out there specifically for enthusiasts of wool carding and knitting, and you want to share your tips for dyeing wool and yarn. My first presentations weren’t even remotely related to my professional work – I spoke at comiccon-type geek conferences about sci-fi and fantasy pop culture. It was a great way to get my feet wet, and I still look for similar opportunities. The lesson is remarkably cliche: think outside the box. Or more accurately, think outside your box. Whatever protective walls you’ve constructed around yourself need to come down. You have so much to contribute in so many different areas. Start creating lists of what you know, what you enjoy, and what you like babbling to your friends and colleagues about. You’ll discover oodles of ideas and thoughts you can, should, and need to share with others. Now with that in mind, let’s look at excuse #1: I don’t know of any conferences. I’ve got three words for you: look it up. You are reading this blog post online. You have access to an internet search engine. Start looking for conferences. To give yourself some framework for the search, think of the most important factors regarding choosing a conference. For most people, the main factors is the physical location of the conference and its audience. This will show me what conferences have taken place in my city and province in the past year. Once I know what conferences have happened in these locations, I can start looking at whether or not they would be a good fit for my skillset and when/where they’ll be happening again in the future. Can I come up with something to share or say that would interest these people? All you are doing right now is hunting for ideas. Don’t limit yourself by worrying about whether the ideas are good or bad or whether you have the “right” to speak at such a conference. Jot down any and every idea for conference talks that come to mind. Explore the conference websites, check out past schedules, see what other people have presented about. Have fun with it. Excuse #2 is invalid, and you are currently working past Excuse #1. Finding a venue to broadcast your message is easy; what’s scary is actually doing it. There are lots of ways you can practice speaking in front of groups or talking with people you don’t know. You can take responsibility for reporting current project activity at the next meeting at work. You can host a party where people outside of your social circle are invited (think baby shower, or a potluck for members of your sports club and their families). You can take on training initiatives for new hires. You can join Toastmasters and regularly practice in front of a bunch of people with similar speaking goals. These are all good steps – they’ll ease you into the world of addressing a group or holding court. There comes a point, though, where these settings are no longer enough. Skill improvement requires constant challenge, and when you get comfortable in one setting it’s a signal to up the ante or change the setting. A favourite challenge I issue to both myself and my clients is to find conferences or similar events and apply to speak at them. There thousands of these opportunities out there for every industry, every profession, every conceivable topic or crowd or interest or milieu. There are events happening in your hometown, or at least within an easy drive. There are events happening in places you always wanted to visit, giving you a good reason for a spot of travel. There are events that you’ve wanted to attend for your own reasons, and presenting at them can often result in a special registration price, or compensation for travel, or an honorarium. There are piles of reasons to give conference presentations a try. So why is it so hard to convince people to do it? Because the emotional risk of applying for and speaking at a conference is much higher than it is at work, or Toastmasters, or the backyard potluck. When you apply to be a conference speaker, you need to invest time in creating a presentation and then submitting that presentation to the organizers for acceptance or rejection. If accepted, you are again faced with in front of a crowd, this time under some mantle of expertise, and the risk of rejection is again there. The crowd might love what you have to say. They might want to gut you alive. When faced with this kind of risk, our knee-jerk reaction is to assume the latter and run screaming for the hills. Most people loathe rejection and we avoid it like the plague. Applying to speak at events means we need to suppress our lizard brain that tells us to hide under the nearest rock. 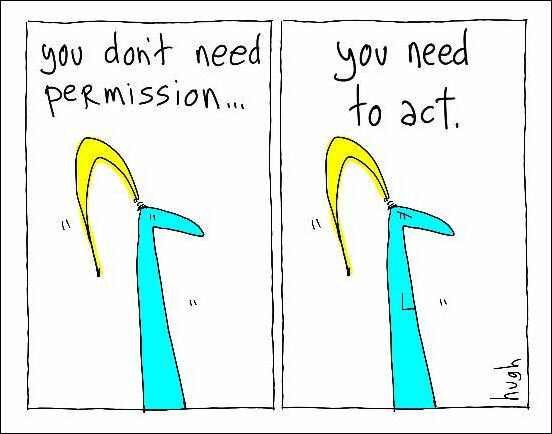 When convincing my clients to apply for conferences, I often come up against a very interesting wall: the need to get permission from their boss. This is a risk-mitigation behavior: if my boss says yes, than someone else is deeming me as being smart or good enough to do this. It gives permission; not just permission to attend this event on company time or permission to spend company funds on travel, but permission to speak. Someone else thinks I’m worthy. If they don’t, then I can blame them for not letting me try. Behold the lessening of risk and dodging of emotional responsibility! By asking permission of an authority figure, we take the onus and emotional risk away from ourselves and place it elsewhere. It’s not me, it’s them. To hell with permission, I say. Why does your boss have authority over your voice? Why let a manager tell you that you have nothing to say? So your boss won’t give you the time to present? Take vacation days. You aren’t permitted to speak at a professional event because you can’t be a representative of your company? Strip your company out of the presentation. You don’t have anything to say about work? Then find an event completely unrelated to work. I got my start speaking by presenting at nerd conferences about topics like video game soundtracks and the different manifestations of deus ex machina in sci-fi TV series. I was interested, so I spoke. I can usually find one or two events my clients could apply for in a 15 minute Google search. It’s when those events are found that the real issue comes up. It flicks across their eyes – fear, apprehension, the certainty that they aren’t worthy of speaking about that topic at that event. I sympathize; those are feelings I still experience myself. At some point, you have to stare those feelings down and say to hell with it. To hell with permission. You don’t need permission, you need to speak. And if you look outside yourself for that permission, you might never find it. So dig deep. Admit that you have something to say, and know that there are people who want to hear you say it. Then put it out there. Find the events, create your proposal, and send the email. The worst that can happen is that they say no, and if that happens you can take that proposal, tweak it a little, and throw it at the next event and the next event and the next. Submitting those applications require permission from nobody but yourself.